Today, Rene shares a roundup of 11 easy craft projects for kids, perfect for National Crafts Month! 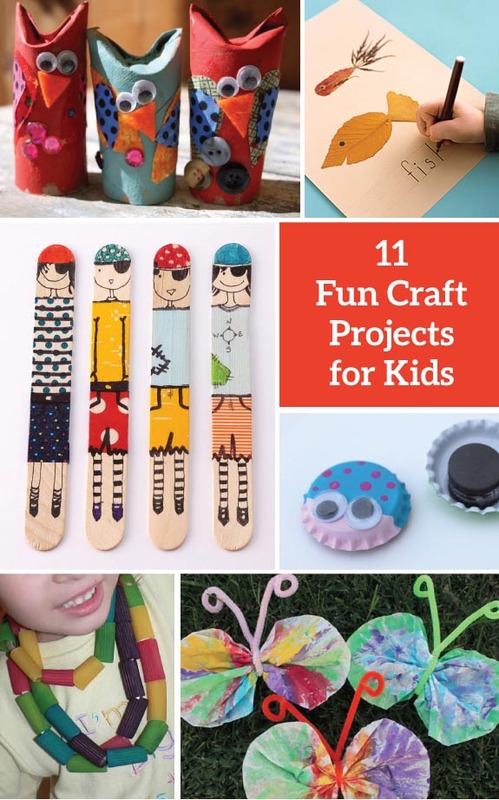 Whether you're stuck inside on a rainy or snowy day, or are just looking for a fun project at home, get little hands busy with cute and simple craft projects that will entertain and engage them. These 11 projects are easy for kids to tackle with minimal parental involvement, so enjoy another cup of coffee while your kids channel their inner mini Martha's! 1. Colored pasta necklaces will help develop fine motor skills in little hands. 2. Toilet paper tubes are a great base for kid-friendly crafts, such as these sweet and simple toilet paper tube owls. 3. 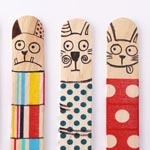 Popsicle sticks and washi tape pair with your child's imagination to create endless possibilities in these craft stick dolls. 4. Fallen leaves become animals in this easy leaf alphabet craft project. 5. Science meets craft with 5-minute gak. 6. Repurpose all of those discarded coffee cup sleeves into bracelets for budding fashionistas. 7. Mom wields the glue gun while the kids are in charge of creating their bug magnet masterpieces. 8. Kids can create beautiful mosaics or scenes with minimal mess for mom to clean up with this tissue and contact paper craft. 9. DIY snow globes are a great way to whittle away at a snowy afternoon. 10. Help lonely, unmatched socks find new lives as snuggly snakes. 11. Evoke springtime with cheerful and colorful coffee filter butterflies.